THANK YOU ALL FOR ENTERING MY FIRST GIVEAWAY!!! What she would do ~ and oh! YAY I WON!!! ~ YIPEEE!!! Lucky Chris, Carrie & Johanna!!! I'm gonna buy the one you have for sale on eBay anyway and maybe that Munsters set too. This was fun & I'll keep coming by with Albus. He wants some of Magick's catnip. Hi Chris, we had a Marvelous Halloween. Love this time of year! CONGRATS ON WINNING MY HALLOWEEN PARTY GIVEAWAY!!! I'm glad you won too, let me know if you have changed your home address & I need to update. I'll be sending out your cool Munsters Postcard this week. 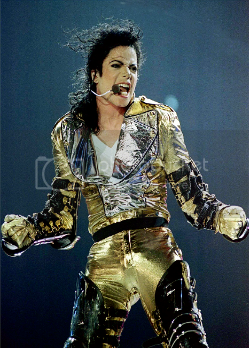 Woweeeeee!!!! I am SO excited! This is my first giveway win!!! What a lucky Halloween for me :). 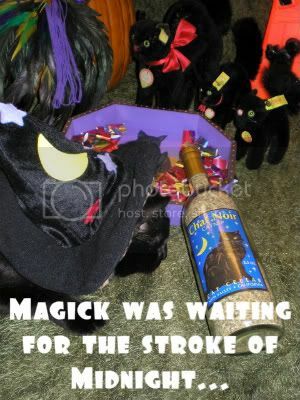 Magick did an excellent job....i hope he is rolling in the catnip right now! Hi Jen, hope your Halloween was wonderful too! Wow Lyndy!!.. 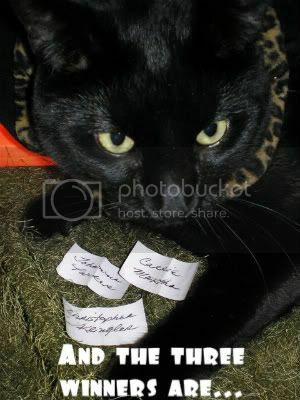 I didn't think I had a chance at winning, but I guess I was wrong... Maybe it helps to have a magikal black cat in my house too :) .... extra good luck for me on Halloween! PS... my addy is still the same...so send it on over! Hi Carrie, Magick is a little dazed from too much catnip... LOL! 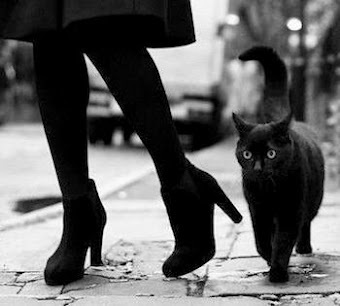 Black Cats have that special Magickal touch! 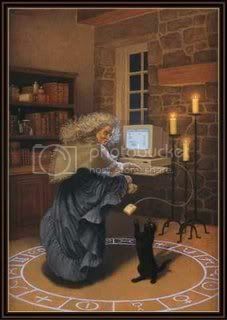 My Black Cat Magick is such a sweet blessing. I'll be sending out your cool Munsters Postcard today. 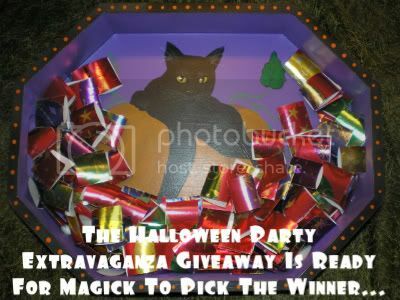 Thank you for showing my one of a kind black cat tray (painting) in your halloween extravaganza giveaway.I also noticed you have added me to your fantasy flights lists.Thank you on both accounts. You are a wonderful caring person and it is a priviledge to know you and be your friend. Congrats to Chuck,Carrie and Johanna as your 3 winners of your halloween give away!! Hi Barbara, you're so very welcome. Your art work is lovely. 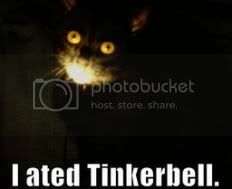 Your name is back linked on both the Halloween Party Winners Post & the Fantasy Flights list. I'll add 'Click Link' to your name on the post. You're a Wonderful Friend & Kindred Sister Sorceress! Oh My, I missed all the fun and giveaway to boot. I'm from Regina, Saskatchewan and I was looking at your wonderful Woodstock post. Super photos and article. 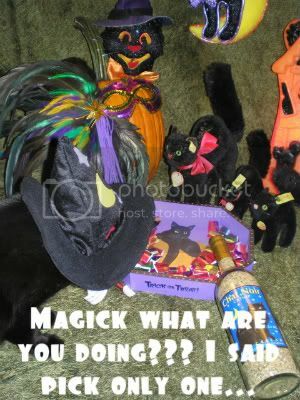 Great montage of Magick The Cat picking your Halloween giveaway winners. Very clever and cute! I have two cats, a Tabby and a Calico, they are my children. Hi, delightful winners post. Nobody I've seen does such a fanfare. Did you have that pretty cat art tray painting commissioned? Because the cat looks just like yours pictured in the post. Does Barbara do commissions? Thank you for your kind comments. I know about cats being children. All my fur babies are my children too! Hope to hear more from you as well. I do know Regina, Saskatchewan is in Canada, but where in Canada are you located??? Hi Donna, thank you for stopping by & leaving your sweet comments. No the pretty black cat art tray was not commissioned. 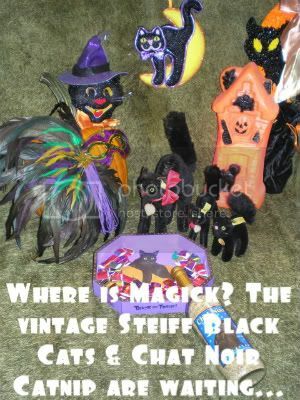 But you're right, the pretty black cat does look like my black cat Magick. 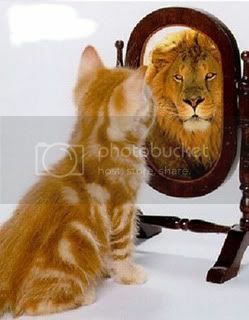 Though he would differ & meow he's handsome! 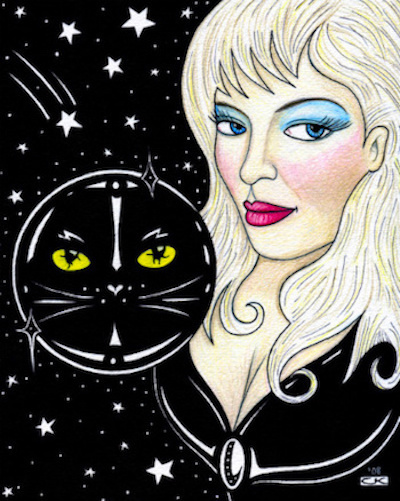 I try to buy OOAK (Original One Of A Kind) black cat art that looks similar to my fur babies... 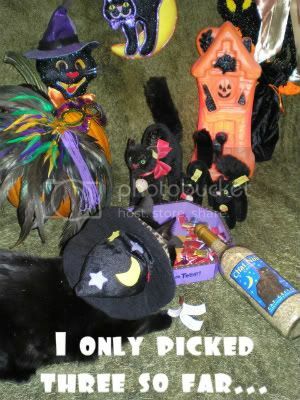 It's fun & keeps me focused on collecting 'Halloween Black Cat Art Work'! Thank you Lyndy & Magick!... I received my postcard yesterday and love it :) The Munsters have a special place in my childhood memories... So, it was fun to open your card and see it! 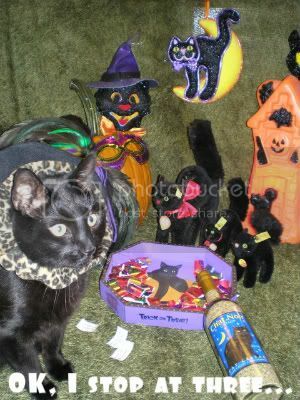 Many thanks again, and give your adorable black cat in that big floppy hat, a big hug from me! I did a PR blog post with a link back to you today on my blog. Have a magical rest of the week! Happy Friday the 13th Lyndy!!! I know you always said 13 is your lucky number, or was one of your lucky numbers. Anyway, it's my lucky number too. 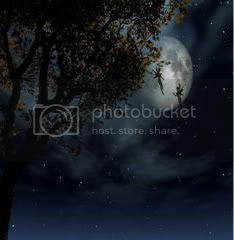 Have a super magickal night. Hi Johanna, thank you for letting me know your Munsters postcard arrived safe & sound. I'm glad Magick picked you as one of the winners. Hope you & yours had a wonderful Friday The 13th! Hi Chris, thank you for letting me know your Munsters postcard arrived safe & sound. I'm glad Magick picked you as one of the winners. THX for the promo links as well. Hope you & yours had a wonderful Friday The 13th too. It's my lucky day! Hope you & yours had a wonderful Friday The 13th too. You're right it's my lucky day! before i left town for the week and had no internet access while i was gone, so i didn't get to write you and thank you or post about it on my blog. I just got back last night and I put it all on my to do list this morning for this week :). I am a bit behind on everything so i will be catching up during the next few days! Thanks so much!!!! It was lovely to receive a special treasure in the mail. Just wanted to let you know that i blogged about you. Sorry it took me so long!! I am literally going cat crazy at the moment...can't seem to get anything done. I need to lock myself in a room with no animal distractions :)!! Thanks so much for the shout out on your blog. I'm glad you received your Munsters postcard gift. I was begging Tom to give me one more postcard to send you if USPS lost it.